« What If Danzig Dated My Daughter? In a move to reestablish itself as a force in the cigarette industry, tobacco giant Philip Morris today purchased exclusive naming rights to emphysema. They will pay the World Health Organization (WHO) 900 million dollars over the next 10 years in order to own the right to name the disease whatever they want to. 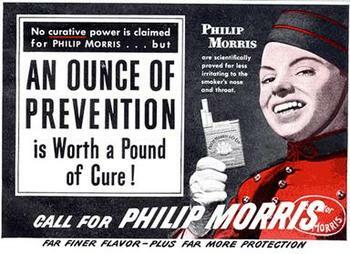 Initially, Phillip Morris simply wanted the words “Philip Morris, Official Sponsor of Emphysema” to be spoken each time the crippling illness was mentioned, but for an additional 100 million per year they have been given the ability to give the disease an entirely new name. In order to get rid of the negative connotations people have with the word “emphysema” the disease will now be referred to by doctors and health care professionals as “Skippy”. “We felt that emphysema strikes a gloomy chord with the public and that there was no harm in brightening the name up a bit,” said Philip Morris Public Relations Director Henry Haldeman. The corporate re-naming of diseases is part of a larger privatization trend that includes selling formerly public property to corporations. It started with the privatization of water supplies and other formerly public resources, but has now moved to more abstract concepts like disease names. The bidding war has already started for the rights to name rhumetoid arthritis and diabetes, the next two ailments that will be on the block. There have been rumors that the right to name several body parts is the next frontier. Last year, The Disney Corporation offered 400 million dollars for the rights to name the human pancreas, but a serious bidding war has yet to develop. Part of Philip Morris’ deal with the WHO is to pledge 10 million dollars a year to emphysema research. According to “We are not trying to convince people that emphysema, uh, excuse me, Skippy, is a good disease. We are just trying to remind people that Philip Morris is an important member of the global community. Therefore, we will continue to maintain our commitment to eradicating Skippy from the planet,” said Philip Morris CEO James Erlichman in a press conference to announce the deal. This entry was posted on April 10, 2011, 3:05 PM and is filed under Health Tips for An Early Death, Pointyheaded Highbrow Stuff. You can follow any responses to this entry through RSS 2.0. You can leave a response, or trackback from your own site. Good one, Keith. Now I’m waiting for the Fast Food industry to give themselves a publicity-makeover. Would Incredible Edibles work? Ha! We shall see, Jim. They might well buy heart disease and rename it “Something That Happens To Other People”. What kind if any impact do you think that the new labeling will have on smokers or more specifically new smokers? It’s a great question, Frank. I’d like to think it will have a major impact. The market for smokers tends to be shrinking thanks to the access to information on the subject. My gut instinct is that this will help to continue that trend. However, sometimes things like this become less shocking as time goes on. It’s possible that people quickly adjust to these images and go about their lives ignoring them. There are plenty of examples of terrible things in our culture that people have become desensitized to and have lost their visceral impact. I really hope to see the new labels make a huge impact. I’d love to live in a world where less people suffered and died due to addiction to cigarettes.